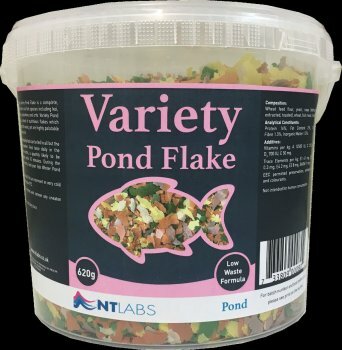 NT Labs Variety Pond Flake is a complete, flaked feed for all fish species including koi, goldfish, shubunkins and orfe. Variety Pond Flake is a blend of nutritious flakes which produce little waste, yet are highly palatable for all pond fish. This high quality food can be fed in all but the coldest weather. Feed twice daily in the warmer months, a quantity likely to be consumed within 10 minutes. Do not feed if fish are dormant in very cold weather below 10°C. Do not overfeed and remove any uneaten food. 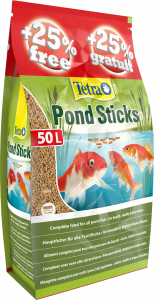 Wheat feed flour, yeast, soya (dehulled, extracted, toasted), wheat, fish meal, fish oil. Protein 16%, Fat Content 2%, Crude Fibre 1.5%, Inorganic Matter 1.5%. Vitamins per kg: A 12500 IU, C 210 mg, D3 700 IU, E 50 mg. Trace Elements per kg: E1 41 mg, 3b202 0.3 mg, E4 2 mg, E5 8 mg, 3b606 11 mg.
EEC permitted preservatives, antioxidants and colourants.